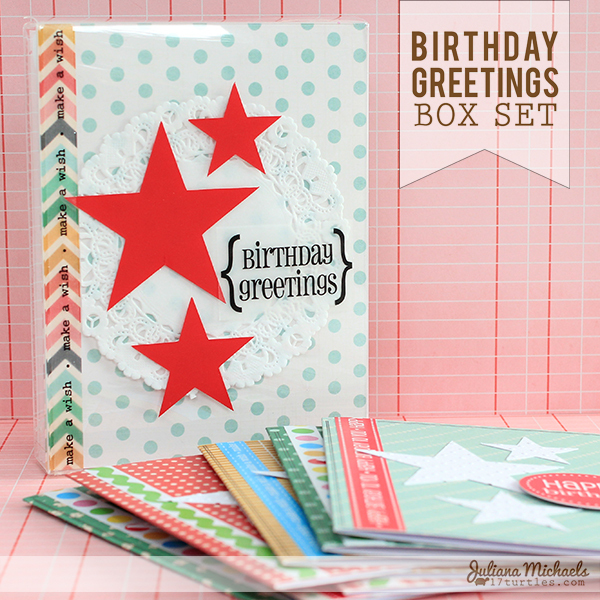 I recently created a set of Birthday Greetings using SRM Stickers fabulous new CHA 2014 products. One of these new products is an awesome A2 Card Box perfect for holding a set of standard size (A2) cards. I created a set of 8 cards to give to my MIL as a gift. She is always needing cards, so I thought this might hold her over for a little while. I also used some of their new Vinyl, which I cut with my Silhouette Cameo, Stickers and Doilies! Make sure you stop by the SRM Stickers blog to see four of the cards I created in more detail! I love the idea of a set of cards as gift ! TFS ! Such a beautiful gift set of notecards, Juliana! I saw this on FB and had to come over to tell you how wonderful it is! LOVE this idea!!! Great note cards! What a GREAT gift idea!! I loveeeeeeee these!!!!! Such a great idea, Juliana!! Your cards are so cute!